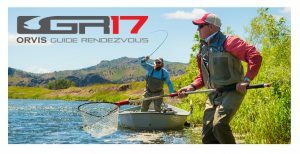 Bob Terwilliger and Chance Berry from our Colorado Outfitters Team will be headed to Missoula, MT later this week for the annual Orvis Rendezvous, April 27-29, 2017. They will be attending the Orvis Guide Rendezvous and the “Down the Hatch Fishing Festival”. These events are a big deal in the fly fishing industry with guides and outfitters coming from across the country. The events are sponsored by Orvis and open to all outfitters and guides who are part of the Orvis Guide Program or an Orvis-Endorsed Operation. These offer an opportunity for professionals in the fishing business to attend seminars, presentations and workshops designed to help improve as a fly-fishing professional and outfitting operation. Topics covered include further skills development (i.e. best practices for teaching how to cast) and related business topics. These events also offer the opportunity to network with other operations to discuss business experiences, issues, etc. in support of improvement and best practices. Lastly, we will get a chance to meet and work with known experts in their field (i.e. certified master casting instructors, better understanding Entomology – “bugs” and fly hatches, etc.) as well as review / test the latest and greatest Orvis Products. We look forward to sharing some of this valuable information with you both on the water and in future Blogs! For anyone who may also be attending the Rendezvous, Bob and Chance hope to see you there!